WWDC 2017 Products Releases By Apple: Apple has announced so many new things at the WWDC 2017 including Hardware and Software with most advanced features. The company has unveiled its most awaited update for the iMac, Siri Speaker, iOS 11, WatchOS 4, and much more. Here we are giving you information about six major updates provided by Apple, this year. macOS High Sierra is the latest version of macOS announced this year at WWDC. It received many new features, improved performance and much more. With the updated macOS High Sierra, users will have improved apps for photos, Safari, better video quality, Virtual Reality, and so many other changes. It is one of the best update provided by Apple this year. In improved Safari, security and privacy of browser history will be highly protected. The latest macOS brings improved photo apps that will have new editing tools with advanced editing technologies. If you are very fond of editing images then you will surely go to love this feature. Virtual Reality will be supported by macOS High Sierra. High-efficiency video coding is the another feature that will support by the updated macOS, this feature will offer streaming of 4K video files at better quality. For complete details visit macOS High Sierra. watchOS4 was announced on Monday at WWDC 2017, it is the updated version of Apple Watch. With this new software, Apple watch will have several new features including Siri, new character faces, better fitness tracking app with updated swimming workouts, improved music experience where user will be able to listen to its favorite music without any effort as the device will search music for the users automatically and the most important thing is that in future Apple watch will pair with AirPods to provide users a better experience. The new operating system announced by Apple will also helpful in making and receiving payments through Apple Pay. Know More: Complete details about watchO4 reveals at WWDC 2017. At the event, Apple announced the updates for iMac desktop after years. With this update, the Apple’s desktop will have enhanced processor and memory power. The display of the desktop will be sharper and brighter. Along with this, Apple has also unveiled iMac Pro having the 5K screen which will available at price of $4,999. Apple introduced its latest mobile software iOS 11 at its developer’s event. This latest software will bring improved Siri, a control center to place all functions in one place, option to keep the message in the clouds, improved hard drive storage space, improved photo app, and much more. The new software will come with feature “Do Not Disturb while Driving” mode. This feature will stop the user from replying to messages by turning the screen of iPhone black. Phone to phone payment will also be convenient for the user. iOS 11 will launch for the users in September this year. 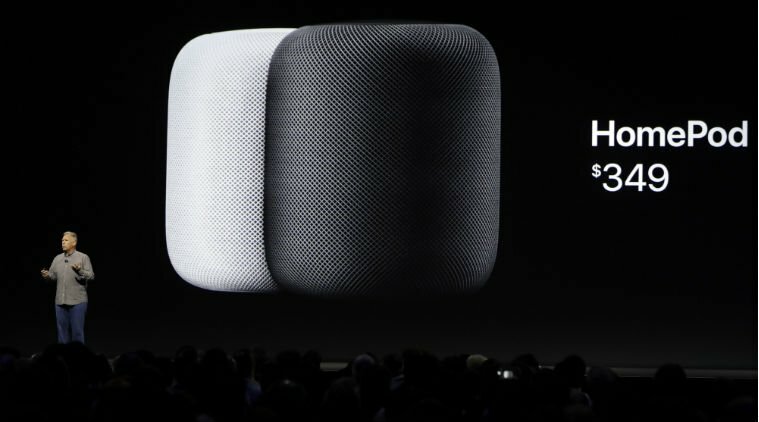 The all new HomePod speaker is Siri-powered smart speaker which is announced by Apple at WWDC 2017, which is announced by the Apple for the first time. This speaker will be powered with Siri Voice assistant to perform all its function such as it will play music, control your home devices, and so many other things over voice command. With this device, Apple will compete with Google Home and Amazon Echo. It will be available at price $349 from December. The new iPad Pro 10.5-inch announced by Apple at WWDc 2017. The body size of iPad Pro is same as the size of 9.7-inch iPad Pro but due to the bezel-less screen, its display size increase to 10.5-inch. The display of newly announced iPad Pro is brighter and have the faster refresh rate. Apple pencil will work more efficiently with this feature and it will also give a better experience in watching movies and playing games on the iPad Pro. It will come new A10X Fusion Processor which is more powerful processor than the previous one. This processor will provide better gaming experience with improvement in other apps also.